The Bloomingdale, Ontario area was first settled by Jacob "Yoch" and Mary Erb Schneider and their eight children in 1806 -- the oldest child was 15, the youngest 2 and Mary was pregnant with their ninth child. Jacob was one of three Schneider brothers to migrate from Pennsylvania to Waterloo Township in 1806 and 1807. "Yoch" was in the second generation of his family in North America; his father, also Jacob, had immigrated to Lancaster County, Pennsylvania from Germany as a young boy. Initially worship services in this little settlement east of the Grand River occurred in local homes. Henry Weber was first ordained for the local worshipping community in 1824. Jacob Schneider donated land for a meetinghouse and cemetery in about 1826; this first meetinghouse was erected close to the location of the present building. The earliest identifiable grave is for Mary Bauman, wife of Jacob Schneider, Jr., who died in 1826. Because of its location the congregation was known as the Schneider Meetinghouse, Snider's Meetinghouse and the Snyder Mennonite Church for many years. The name changed to Bloomingdale Mennonite Church in 1960. The original building was apparently destroyed by fire. The core of the present building was erected in 1872 by Menno Bowman. A division in the Mennonite Conference of Ontario in 1874 had a major impact on the Schneider congregation. Minister Moses Erb and lay leader Menno Bowman sympathized with the new "Reforming Mennonite Church" that was established in May 1874. This group soon joined with the New Mennonites in 1875 to form the United Mennonites. While Moses Erb soon returned to fellowship with the the Mennonite Conference of Ontario, Menno Bowman went on to become a leading minister among the United Mennonites (later known as the Mennonite Brethren in Christ after another 1883 merger). The building was used by the United Mennonites until 1879, when possession reverted to the more conservative group. In January 1879 descendants of Yoch Schneider conveyed the property to trustees representing the conservative faction when the earlier deed, which was never registered, could not be found. This division devastated the congregation for many years. 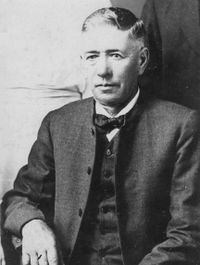 Services were held only monthly until 1906, and there was no resident minister until Jesse Martin was ordained in 1903. Martin was the last minister at Bloomingdale to be ordained by lot. The 1870s buildings was initially built with two entrances -- one for men and one for women -- as was customary in the conference at the time. During the time the building was used by the United Mennonites the two doors were replaced by one door. When the conservative element regained the building in 1879 they again installed two entrances. Subsequent renovations in 1951 removed the separate entrances, as well as the partitions in pews. At that time families began to sit together. In 1985 there was a major expansion that included a new entrance, offices and Sunday school rooms. Minister Bertha Landers was one of the early women ministers in the Mennonite Conference of Ontario in 1984. Foot-washing was omitted from communion for the first time in 1966. Mennonite Reporter (2 October 1972): 4; (19 September 1994): 8. Sauder, Dorothy. Trail's End, the Oxbow: History of the Bloomingdale Church, 1972. 1972, 18 pp. Steiner, Sam. "Effects of the 1870s New Mennonite Division on Bloomingdale Mennonite Church." Ontario Mennonite History (April 1997): 28-31. Mennonites in Canada collection (1870-Bloomingdale). Mennonite Archives of Ontario. Cressman, Clare. "Bloomingdale Mennonite Church (Bloomingdale, Ontario, Canada)." Global Anabaptist Mennonite Encyclopedia Online. August 2009. Web. 20 Apr 2019. http://gameo.org/index.php?title=Bloomingdale_Mennonite_Church_(Bloomingdale,_Ontario,_Canada)&oldid=146926. Cressman, Clare. (August 2009). Bloomingdale Mennonite Church (Bloomingdale, Ontario, Canada). Global Anabaptist Mennonite Encyclopedia Online. 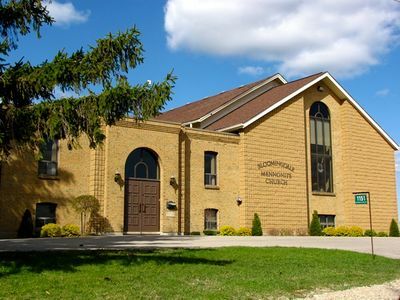 Retrieved 20 April 2019, from http://gameo.org/index.php?title=Bloomingdale_Mennonite_Church_(Bloomingdale,_Ontario,_Canada)&oldid=146926.